No more disgusting schmeers with that bagel? Posters like this, which created a sensation at the checkout counter of the Montague Street Bagel Shop in Brooklyn Heights, may soon bite the dust. The city's campaign to gross out smokers with grotesque images of cancer-riddled human lungs and other body parts was struck down Wednesday by a federal judge who ruled that only the federal government can require warnings related to cigarettes. Can you get to Prospect Park by 2 p.m.? Massive snowball fight! More here. - All New York City area airports are closed; check back this afternoon. 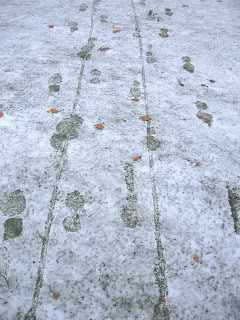 - Officials urge travelers to stay off the roads. Cars are trapped all over the place; the Wall Street Journal reports that a tractor trailer and at least two cars were abandoned on the westbound Brooklyn Queens Expressway near Hamilton Avenue. - Subways: Ironically, only the G train and the 7 line are running without delays. Buses: about half are running. See MTA before riding. - Commenters at the NY Times say passengers are trapped at local airports, passengers have been trapped on subways and the PATH. Blizzard in New York City: Just Stay Home! 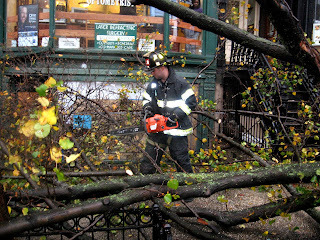 Stay where you are if you can is the message from the National Weather Service and New York City Mayor Bloomberg. 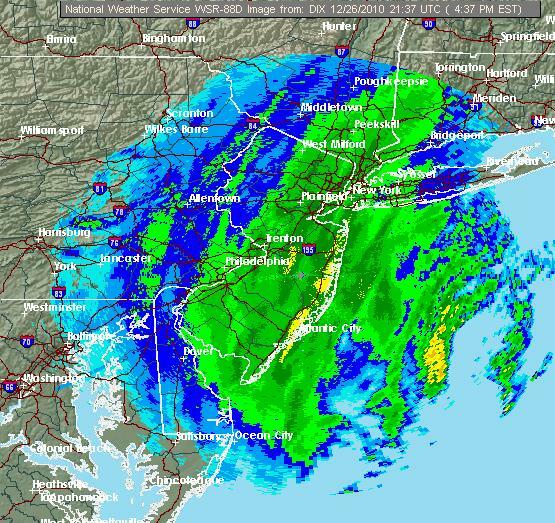 Today's dangerous blizzard is causing chaos for travelers at airports, on trains and for drivers -- visibility on roads is, in some areas, down to near zero. 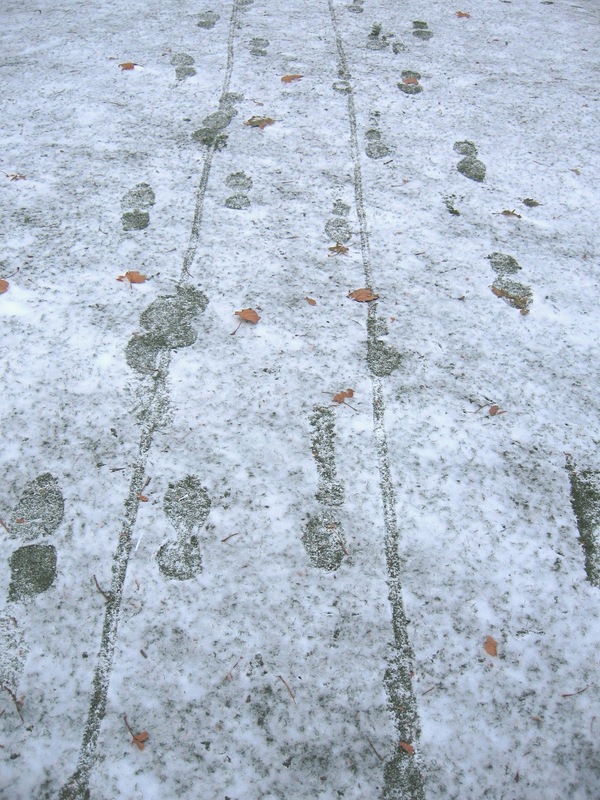 The current forecast calls for 11-16 inches of snow accompanied by strong winds: High near 28, blustery, with a north wind around 25 mph, with gusts as high as 44 mph. Watch out for falling tree limbs! Train #67 (25) is canceled between Richmond and Newport News with no alternate transportation. Train #66 (26) is canceled between Newport News and Richmond with no alternate transportation. Train #99 (26) is canceled between Richmond and Newport News with no alternate transportation. Train #157 (26) will terminate at Washington. Passengers will be accommodated on train #99. Train #94 (27) is canceled between Newport News and Richmond with no alternate transportation. Train #86 (27) is canceled between Richmond and Washington. Passengers will be accommodated on train #174. Call 1-800-USA-RAIL or see the latest updates at Amtrak. 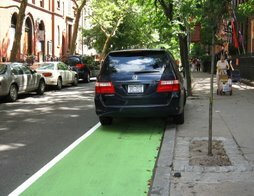 The city has suspended Alternate Side Parking Regulations citywide for Monday, Dec. 27. Parking meters will remain in effect throughout the city. We'll be on the road for a few days. Hope your holidays are the best ever! - About those new towers coming to Downtown Brooklyn. The Observer says, "Meh." - Did you miss the lunar eclipse? Watch the video here. - to McBrooklyn's HOME PAGE. The Fire Department halted Bob Diamond's famous Atlantic Avenue Tunnel tours last Friday for safety reasons, but the Department of Transportation won't let him implement a major fix that FDNY requires, according to an email Diamond sent in. FDNY says the tunnel is unsafe because, for one, it has only one entrance -- through a manhole at Atlantic and Court Streets. They say that they might consider reopening the tunnel if ten changes are made, including opening another entrance, perhaps through a ventilator. They also want Diamond (or someone) to install code-compliant electrical wiring and lighting, provide first-aid equipment and more. However, Diamond told the Brooklyn Eagle yesterday that he has repeatedly asked DOT to build a second entrance, but the DOT has refused to do so. On top of that, Diamond said in an email to us, "DOT won't give us work permits to open the other existing tunnel entrances. Recall the movie Catch 22 -- this is it!" The NY Daily News, Gothamist and the Brooklyn Eagle have more to say about this. - Atlantic Tunnel's Bob Diamond Leaving Brooklyn? Say It Ain't So! Like most of Brooklyn, we headed out to the Brooklyn Flea's Gifted market this weekend to try to find unusual, artistic and unique presents for friends and family. We're kind of picky AND don't have as much money to spend this year . . . but we're happy to report that we found some really excellent handmade gifts that we never would have found in the typical department store or gift shop. 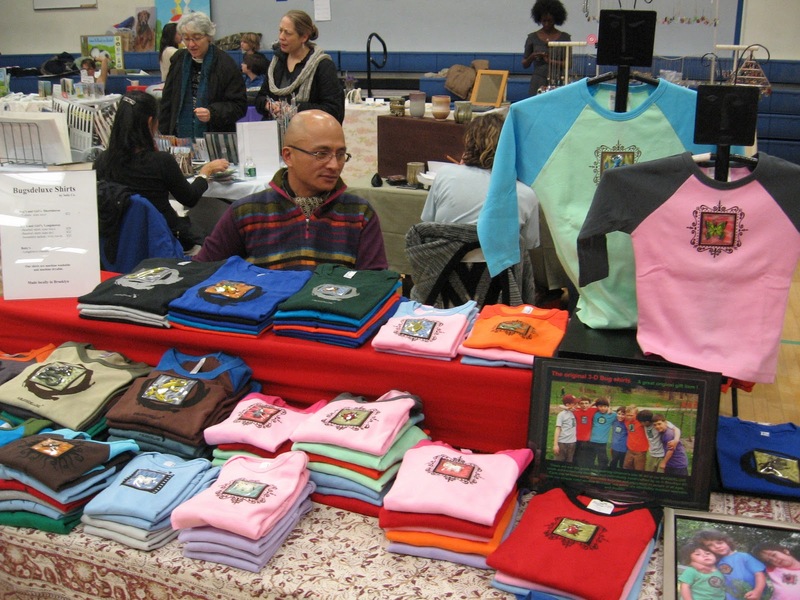 This year the Flea is operating through December 23 at One Hanson Place (the old Williamsburg Bank Building) from 11 a.m. - 7 p.m.
We bought handmade T-shirts (some with really dark designs, like evil-looking black crows); jewelry; cast-iron wall-mount bottle openers; teeny-tiny terrariums; ceramic kitchen stuff; magazines from 1943; fingerless gloves; skin cream and a really unusual jewelry/accessory thing. 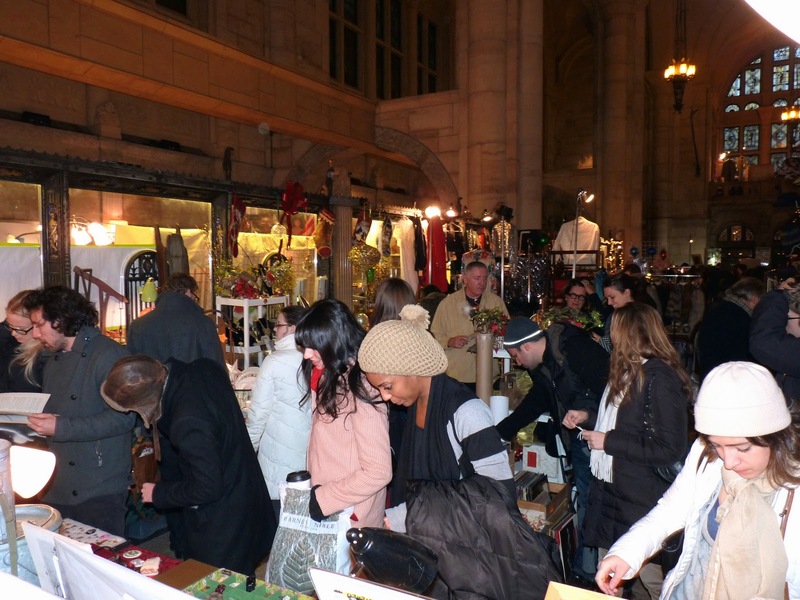 Here are a few photos -- the Brooklyn Flea web site lists all of the holiday vendors so you can check it out before you go. 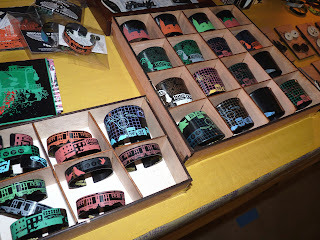 WrecordsByMonkey: These Wrecord bracelets, above, are hand-fashioned out of recycled records. WrecordsByMonkey also makes postcards, mirrors, switch plates and other amazing things, all out of recycled records. 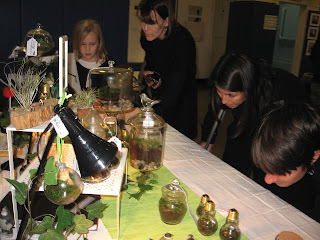 Tiny Terrariums by Twig: We saw Twig's terrariums at P.S. 29 last week and were blown away. 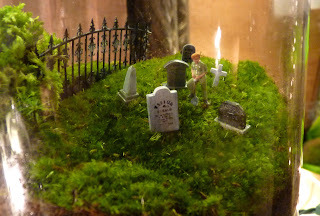 These teeny, tiny terrariums are created with little scenarios inside -- scenes of love, crime or melancholy -- a living world in a little container. 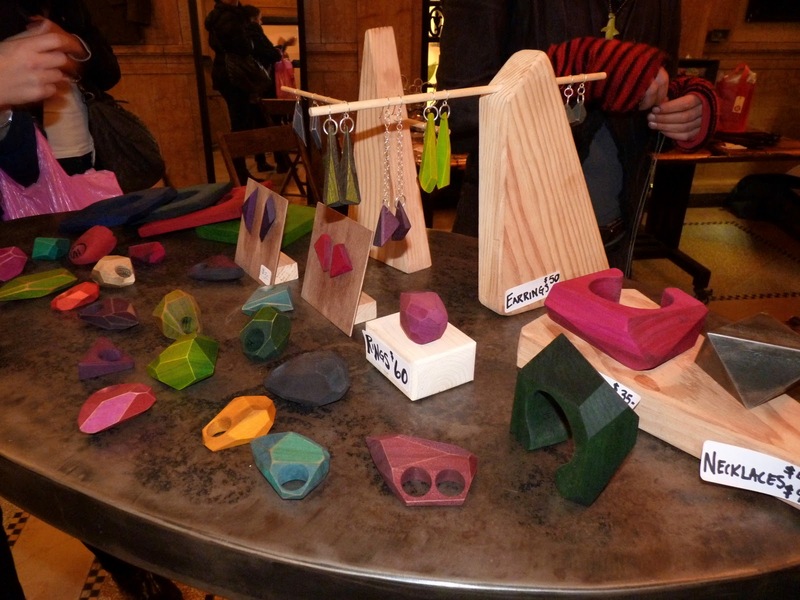 TMR NYC (Total Metal Resource) was selling these chunky rings and other jewelry, above. They were also selling some amazing steel MetroCard holding belt buckles (see here for photos). 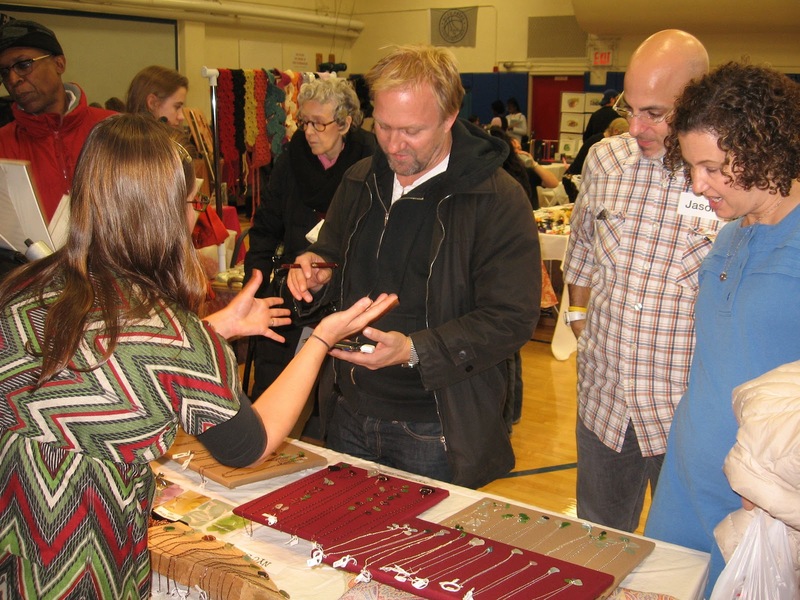 If you want to buy someone some jewelry you will probably find something you like here. (If you want to buy someone an antique typewriter, that's here, too.) There is plenty of cute handmade kids clothing at the Flea, as well as brass knuckle/rosary bead necklaces and raw chocolate. If you can head out there at odd times you'll be better off as the vendors tell me that the place is packed during your typical shopping hours. Baltic Street Conversion in Cobble Hill, Plus the Ohs Are Back Home! 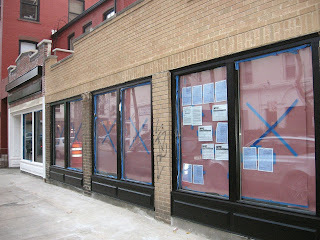 These storefronts extending from the rear of 232 Court Street along Baltic Street were recently garages. 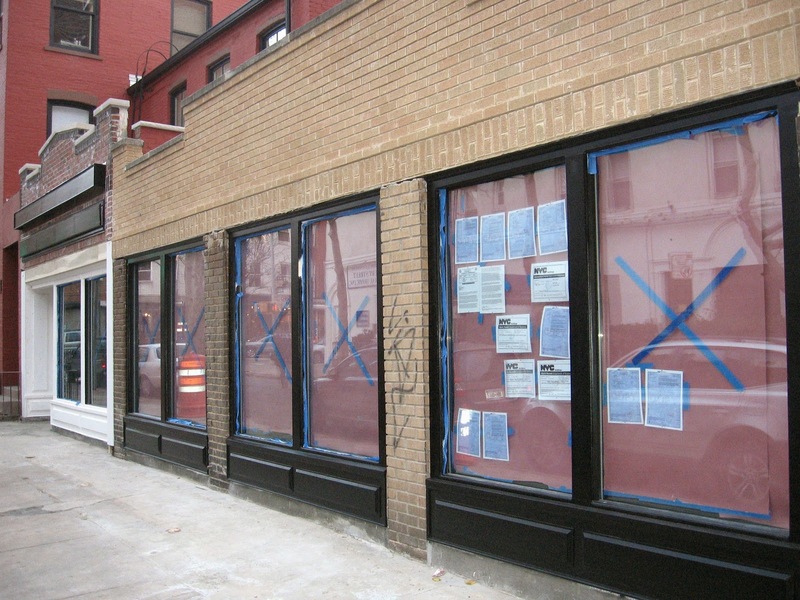 In September the Landmarks Preservation Commission approved the removal of the four garage doors, to be replaced with black-painted wood storefronts. The wood and glass entrance door is in the eastern-most bay (all the way to the left). Before that, 232 Court Street had been for 25 years the home of Trusting Cleaners, one of the most beloved businesses in Cobble Hill, if not all of Brooklyn. Sadly, the Ohs home on Smith Street was destroyed in a fire shortly after they lost their business. But here is the good news: the Ohs have moved back home, helped by all the good karma they spread around their neighbors for 25 years. Read the story of their homecoming in today's Brooklyn Eagle. Ever link to an online forum and read a post from the middle of a thread? Sometimes it makes perfect sense but sometimes it will never, ever make sense, even if you back up and go all the way to the beginning of the thread. 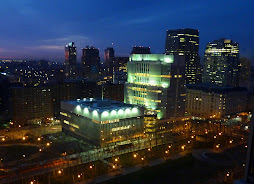 Here are a few random posts from the Brooklynian forum that we swear we get. But then maybe we don't. - A» I'm at the award ceremony now at St Teresa RC Church. James Caldwell just said that Bruce Ratner is "an angel sent from God". Should we put this on the church and morality thread? B» Nah, that thread is in a nice place at the moment. ...we will mess it up when the crazy fake nun family appears again.
. . . Upon arriving home, my dog Dude and I decided that today's walk should be to the new Jewelry Store on Franklin. 1. Dude the dog. "Dude"
2. Dude's caretaker, Whynot. "Whynot, WH"
3. Woman at Jewelry Store "Woman, WO"
WH: You guys are open? WO: Yea, couple days ago. WH: Some of the local blogs and organizations tried to stop you. WO: I know. I don't know what that is about. WH: Anyway, you or your boss posted people should stop by to say "hi", so I decided to. I post on Brooklynian as Whynot. My avatar is my dog. WO: Ah. Um, you want to talk to him? WH: Dude, come on boy. 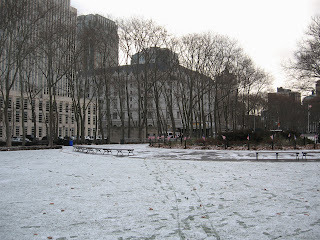 From: Prospective Park Place Pawnshop! I think it had a two-year lifespan. The second year that I walked up to get a close up...something was amiss. I think it lost one of its colorways too. 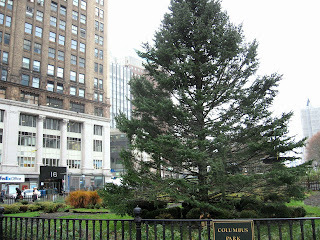 From: Where Is the Grand Army Plaza Christmas Tree? if you dig below freddy's basement, past the alligators, through the earth's core, back up to the surface, you're going to hit china. Fort Greene Association: Bring Back the Beat Cop! Crime is up 11 percent, and the Fort Greene Association is spearheading a movement to bring back the beat cop. Back in the early nineties Police Commissioner Kelly and Mayor Dinkins started the Safe Streets program which included beat cops. The FGA says this brought about a decline in crime and "fostered the renaissance of Fort Greene and Clinton Hill." But the program seems to become mired in the budget morass. A beat cop is a police officer who patrols a specific neighborhood, called a “beat.” He or she becomes well-known and helps to create a positive relationship between law enforcement and the community. Community Policing is the modern offshoot of the historical beat cop. 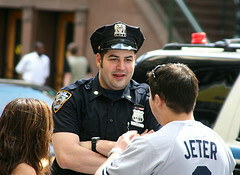 In 1990, the NYPD selected the 72nd precinct in Brooklyn to test the Community Policing model. According to Crime and Delinquency, results showed that officers "had favorable impressions of community policing and that they were able to identify residents' concerns and develop effective methods for solving neighborhood problems." The FGA wants you to write to Police Commissioner Kelly to urge him to put the cops back on the beat. See FGA's letter here. Photo by Video4net, Creative Commons license. 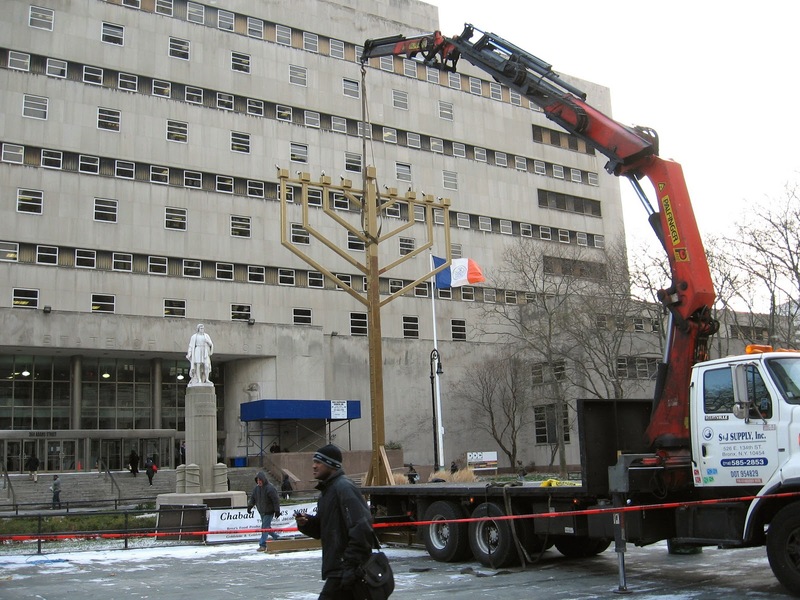 It seems early for Chanukah to be over -- but yesterday a crane airlifted the giant Menorah set up at Brooklyn Borough Hall Plaza and trucked it away. Now the question is, where do giant Menorahs live when it's not Chanukah? Just a light dusting, but out in Cadman Plaza Park (Brooklyn Heights / Downtown Brooklyn), it looks like a real snow! 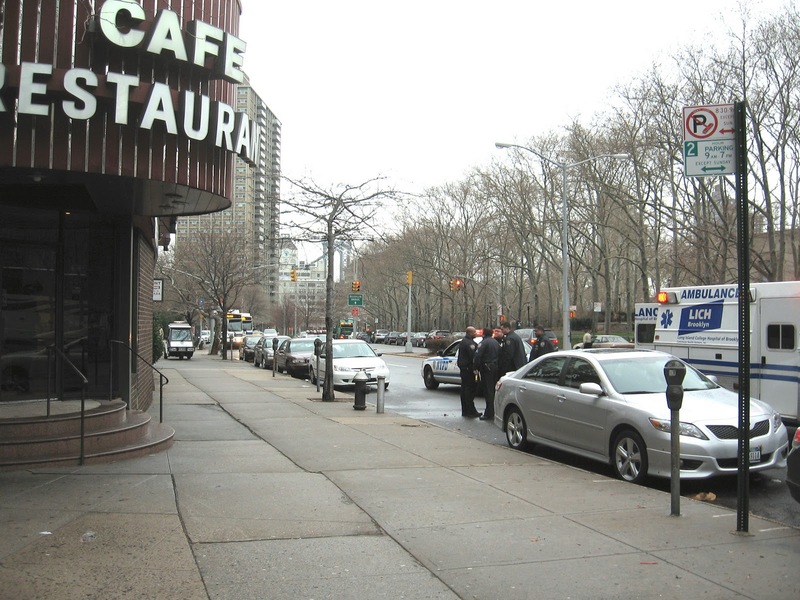 An emotionally disturbed man was detained by police in front of the Park Plaza Diner on Cadman Plaza West at 4:30 p.m. yesterday after swinging a metal pipe (or possibly a hammer, see below) at at least two Brooklyn Heights pedestrians. One woman narrowly avoided serious injury when she dodged the attacker while walking along Montage Street. 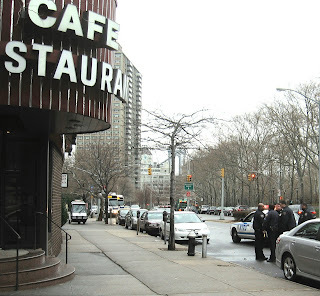 A witness said that a second person who had been threatened rode with police around Brooklyn Heights and spotted the attacker near the diner. The man was said to be in his 60s, balding, with dark skin, a gray beard and gray sweat pants. He was arrested and sent to Long Island College Hospital. UPDATE: The Brooklyn Eagle has a photo of the man and more information, such as the weapon may have been a hammer: "One woman said something about the man caused her to turn around to look at him just in time to dodge the hammer swinging towards her head . . . "
At long last, we may finally learn What's Behind the Wall! "Its been a long time coming -- National Geographic TV is going to start shooting the one hour Atlantic Avenue Tunnel documentary this weekend! It's expected to air in November, 2011. Needless to say, I'M VERY EXCITED !! "This weekend, they plan to start interviewing me in the tunnel. 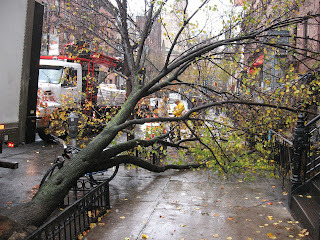 I'm told that the City (DOT) is going to let them scan Atlantic Avenue the second week of January 2011, and if they get a good 'hit,' then dig. 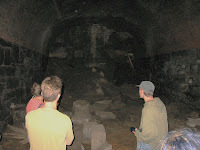 Diamond discovered the long-lost tunnel -- which runs under Atlantic Avenue between Boerum Place and Hicks Street -- in 1981, after hearing about the legend of a Civil War era rail tunnel on a radio show. After an eight-month search (during which he was repeatedly advised by City officials to give up on his lost cause) he struck gold -- uncovering, intact, the world's first subway tunnel. 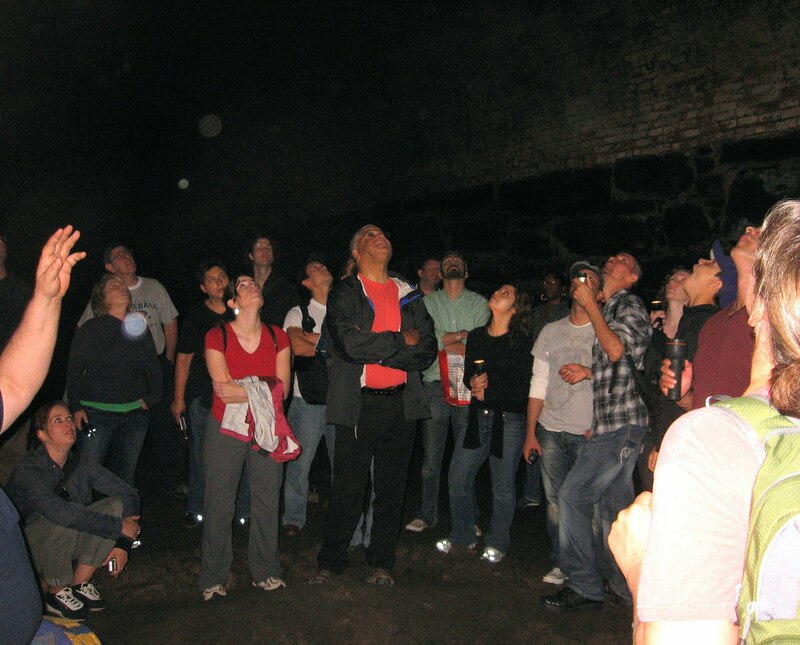 Since then, thousands have ventured down into that mysterious place deep under Atlantic Avenue between Brooklyn Heights and Cobble Hill to hear his incredible tale of how it came to be built in 1844, then forgotten, and then found again in 1981. Diamond has tried for years to get permission and funds to knock down a wall at the west end of the tunnel. He thinks there may be a perfectly preserved locomotive from the 1800s behind the wall -- or even the missing pages of Booth's diary that list the conspirators involved in Lincoln's death. He is influenced in this thinking by the civil war "docudrama" the Cosgrove Report, which asserts that the missing diary pages of John Wilkes Booth were hidden in the tunnel in April, 1865 as the assassin escaped to Europe and then India. The wise kings, a shepherd, Joseph, Mary, another woman and animals are watched over by a hovering angel as they admire the Child in his manger in front of Brooklyn Supreme Court in Columbus Park, Brooklyn Heights. 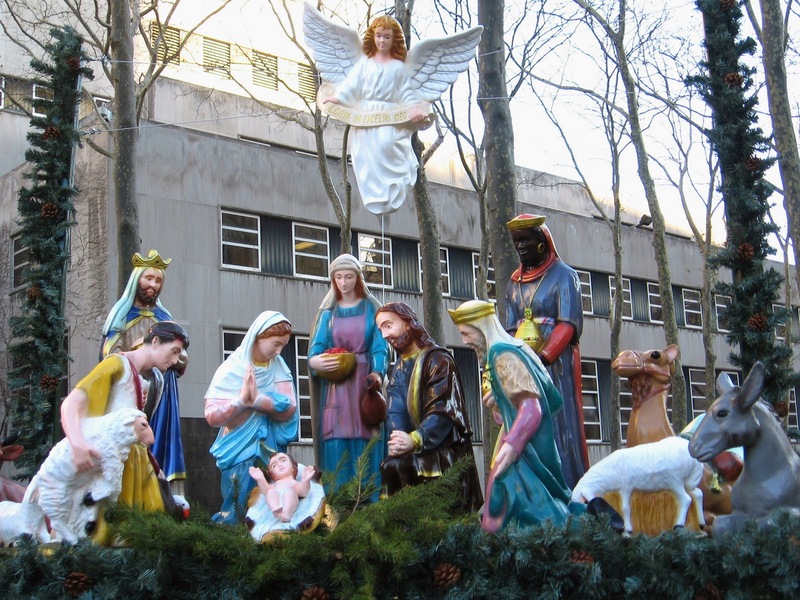 This creche is installed every year by The Catholic Lawyers Guild of the Diocese of Brooklyn, which held the Nativity Dedication and Blessing yesterday afternoon, followed by a cocktail party at Eamonn’s on Montague Street. According to the official web site, "Santacon is an annual convention for Santa and his holiday brethren. 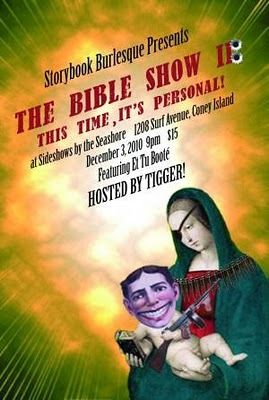 Expect holiday cheer, unconventional gifts, naughty carols and general mayhem." After hundreds of authentically-dressed Santas and the odd reindeer meet up at a secret location (sometimes in Brooklyn, sometimes not) they invade bridges, subways and buses in their trek around town, showing up en mass at tourist destinations, malls and, most importantly, bars. Where they are expected to tip decently. Because if Santa screws you, the world is a bleak place indeed. For official SantaCon rules, see here. UPDATE: This event has sold out. See note below. UPDATE 2: Fire Department cancels event! 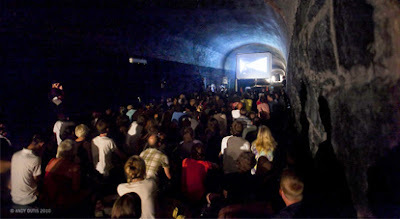 Bob Diamond's famous Atlantic Avenue Tunnel is the awesome venue for this weekend's Rooftop Films presentation. Diamond's regular Atlantic Avenue Tunnel tours, where flashlight-bearing urban spelunkers climb down into a half-mile ling, cavelike tunnel deep under the avenue (near Trader Joe's), attract hundreds. Prior to the screenings, Bob will be conducting a tour of the tunnel, and his recounting of the history of this historic treasure is not to be missed. Following the screening, there will be an after party at Last Exit Bar and Lounge at 136 Atlantic Avenue, with complimentary drinks courtesy of Sailor Jerry Rum. Saturday's event is sold out. Some tickets left for Sunday; see below. - On Saturday, several films will be presented in the theme of "Trapped In the Tunnel" -- Here's the blurb: "Freaks lurk deep below ground, and normally they stay out of sight and don't interfere with the lives of us surface dwellers. If you are curious about subterranean life and aren't feeling too claustrophobic, join us on December 11th for a program of films about people who wander into mysterious realms from which they just might never escape. The only way out is the way you came in." UPDATE: Sorry, the Sunday show just sold out, too. Rooftop Films informs us that there will be more of these shows in February. - On Sunday the theme is "Tunnel of Love." Tickets are $20 online or at the door. Tickets and more information here. IMPORTANT - Please Note: Must be 18 or over to attend the screening (after-party is 21+). 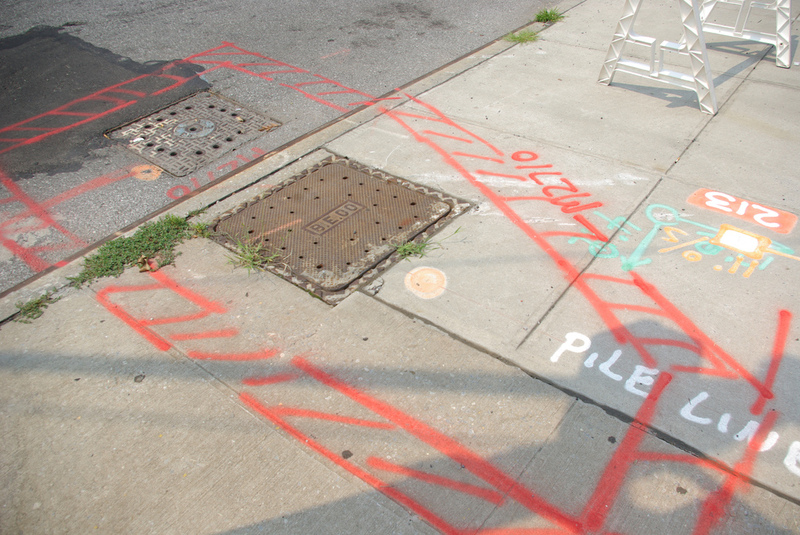 Entrance is through the Atlantic Avenue Tunnel via a ladder through a manhole in the middle of Atlantic Avenue. Attendees should wear comfortable shoes and those who are incapable of climbing up and down a 10-foot ladder should not plan on attending the event. You must sign a liability waiver before entering the tunnel. There are no chairs in the tunnel. 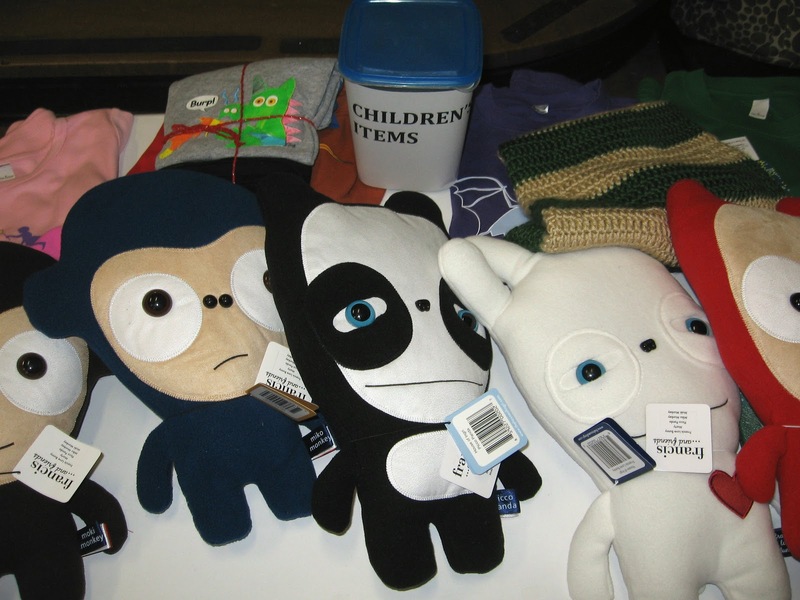 Tarps will be placed on the ground to sit on, and attendees may bring small cushions as well. There are no bathrooms in the tunnel. 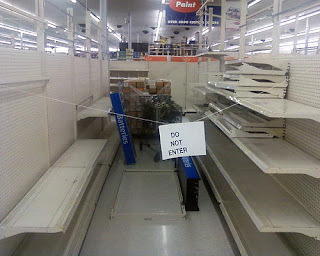 Plan on using a restroom before you enter. 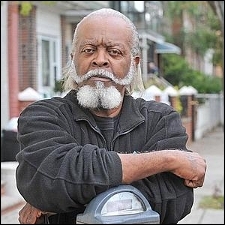 A live music performance by Jimmy McMillan of The Rent Is Too Damn High Party is presented by Scenic at Europa on Thursday, December 16 at 7:30 p.m.
UPDATE: A commenter points out that Mr. McMillan has made a series of offensive anti-Semitic remarks. See comments below. If you can't make the party, why not buy the Jimmy McMillan action hero doll from Herobuilders? Only $39.95 -- or, for $10 more, you can get the SPEAKING version of the Jimmy McMillan action hero doll. Click here to hear what he says. 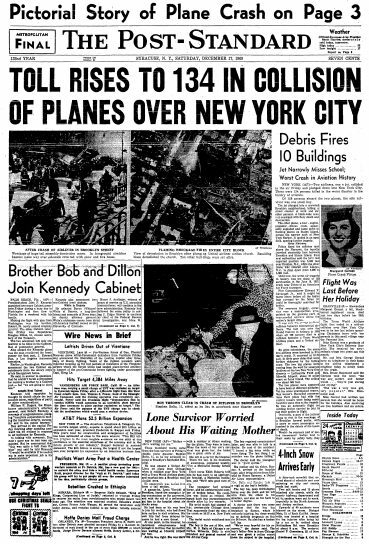 On the morning of Dec. 16, 1960, 134 people lost their lives when United Airlines Flight 826 and TWA Flight 266 collided over the skies of Staten Island. 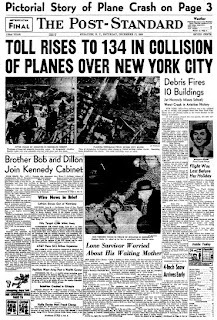 The United aircraft crashed in Park Slope, at the intersection of Sterling Place and Seventh Avenue. 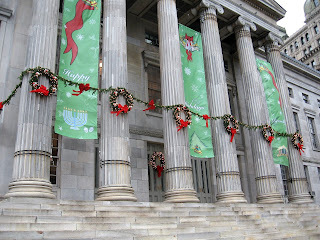 On Thursday, Dec. 16, 2010, at 9:45 a.m. -- 50 years to the day of the tragic crash -- Green-Wood Cemetery will be honoring those who perished, both in the sky and on the ground, by unveiling a new eight-foot memorial. The granite monument will stand sentinel near the gravesite where the unidentified remains of victims have rested for half a century. This special unveiling ceremony and memorial service are co-sponsored by New York Methodist Hospital and the Park Slope Civic Council, and are free to the public. Participants will gather at the cemetery's main entrance at 25th Street and Fifth Avenue at 9:45 a.m. The service will begin promptly at 10 a.m. Please RSVP with Isabella Vlacci at 718-210-3024. Photo of newspaper courtesy of Wikipedia. The tree has been ready for a couple of days now: Celebrate the beginning of the holiday season with the traditional lighting of the Christmas tree tonight in Columbus Park, right in front of Brooklyn Borough Hall. 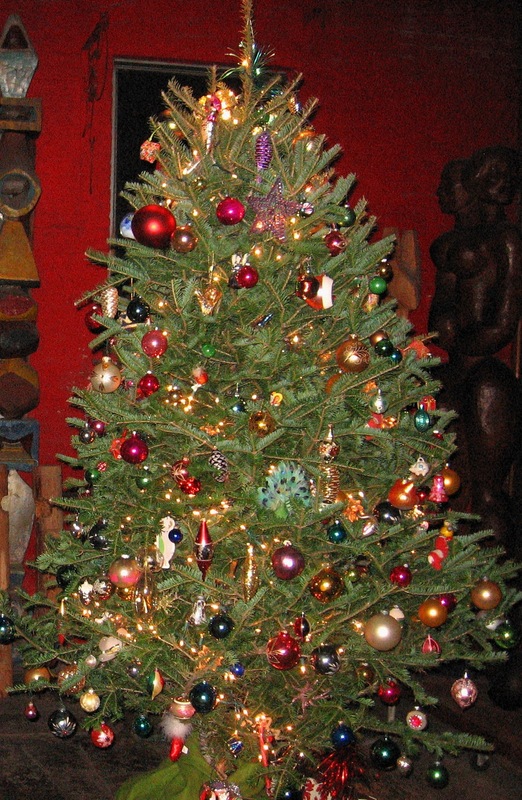 The event, at 5:30, will include entertainment, refreshments and a visit from Santa. Dress warmly, it's going to be FREEZING and windy. Borough Hall is already decked out and looking cheery for the holidays. It took one of the most powerful newspapers in the free world to bring to justice a Brooklyn criminal who terrorized customers over the Internet. 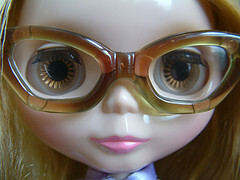 Vitaly Borker, who operates the eyeglasses web site with the awkward name DecorMyEyes was finally arrested Monday. Even though his victims had complained to the police that he cheated them, threatened to sexually assault them, sent "I know where you live" photos of their own buildings to them, sent manacing letters to their employers and more, no one did anything until the New York Times visited the creep. Borker bragged that every online complaint only raised his Google profile. After the story came out in the Times, Google said they were going to recalibrate their algorithms so crime doesn't pay (at least crime won't push a company's search rankings higher on Google). And finally, law enforcement got into gear and arrested Borker (the load of guns found in his apartment doesn't help his case). Blogs are wonderful -- but may we suggest that everyone go out a buy a copy of the Times now and then? 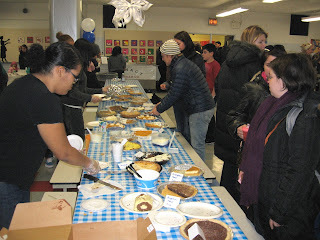 There were literally hundreds of delicious pies at P.S. 29's “Eat Pie and Shop” Holiday Gift Fair and Pie Social in Cobble Hill, Brooklyn yesterday. Local bakers – both amateurs and professionals – cooked up sweet pies (fruit and berry, along with pumpkin and custard) and savories, like quiche. 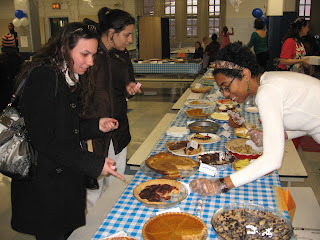 The pies were judged by parents and a panel of celebrity chefs, and were eaten by hoards of ravenous shoppers like us. Where to start? Pumpkin is usually one of our favorites but this time we couldn't resist the double-crust apple pies, which looked like they had black birds baked inside. The pecan pies were teeth-rattlingly sweet. Some people went for the chocolate cream. We don't really hold with that. After stuffing our faces we staggered out of the cafeteria to do some shopping at the gift fair, which had a really nice assortment of cute handmade items. 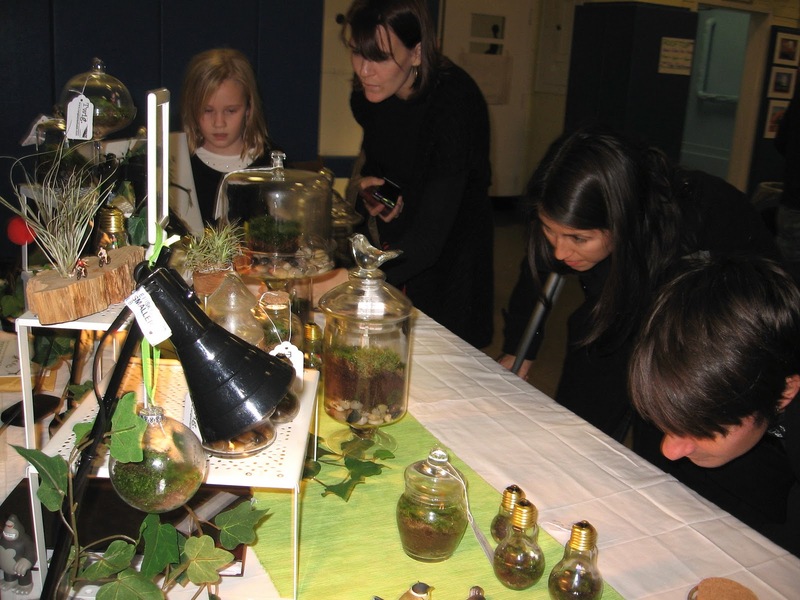 Our favorite: tiny little moss terrariums built inside light bulbs, little glass jars and blown glass orbs made by Twig Terrariums, run by Michelle Inciarrano and Katy Maslow from Brooklyn. 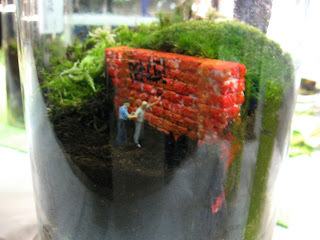 Beside plant life (easy to maintain, they say) each terrarium contains a little scene with teeny-tiny people. Inside this one, for example, a cop is arresting a guy in a graffiti-strewn park. Very cool. 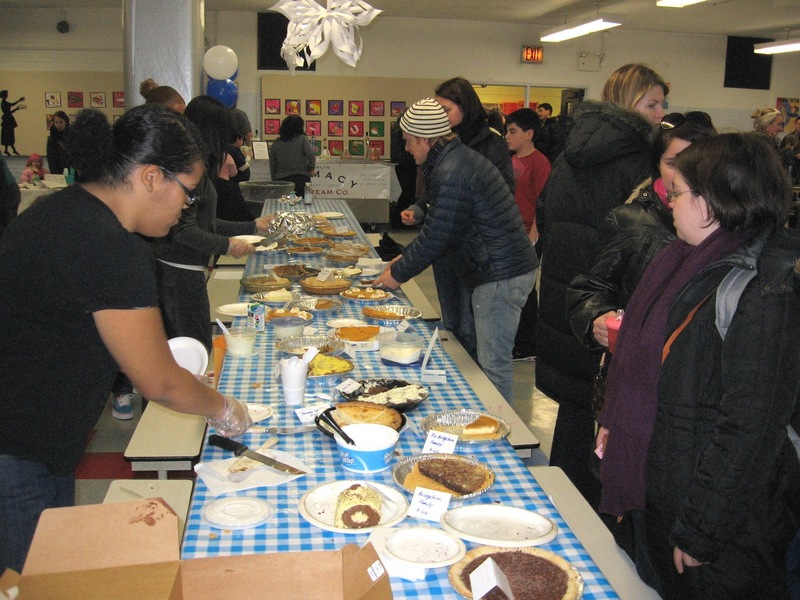 All in all it was a great event (sponsored by Fork + Pencil, Half Pint Citizens and Brooklyn Farmacy & Soda Fountain), and even better because the proceeds went to support the P.S. 29 PTA. 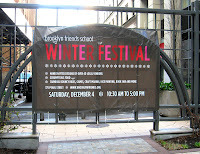 To see the action at the Brooklyn Friends School Winter festival, look here. Once again the selection of crafts at the Brooklyn Friends School's Winter Festival on Saturday was outstanding. 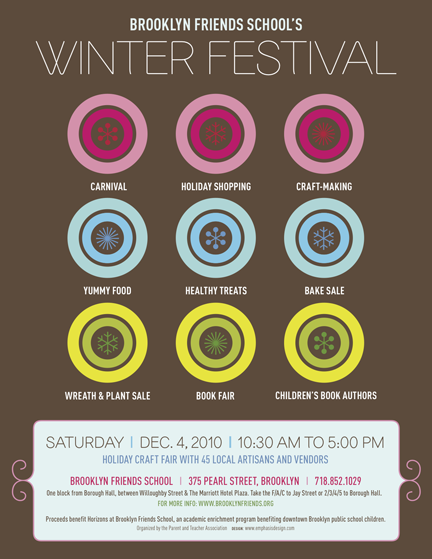 Several floors of the school (in Downtown Brooklyn next to the Marriott on Pearl Street) were transformed into a winter wonderland with the huge craft sale, a holiday plant sale, lunch and baked goods, entertainment and children's stories, a book fair and a children's carnival. There were many different styles of jewelry in roughly two categories: the pretty, delicate kind and the clunky, heavy kind. Above -- the pretty, delicate kind. These T-shirts featured 3-D bugs in a little clear pouch. Fine & Raw Chocolates makes famous "artisan confections." 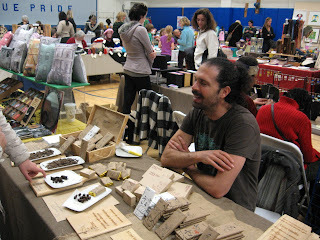 If you missed them Saturday, try the Brooklyn Flea. 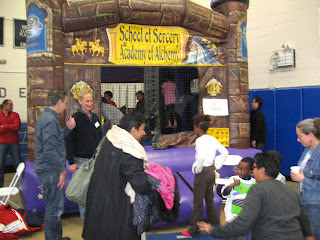 Upstairs , there were games and bouncy things for kids at the carnival, including this School of Sorcery and Academy of Alchemy castle. Our favorite was a huge bouncy maze, which, if no one was looking, we would have been all over. 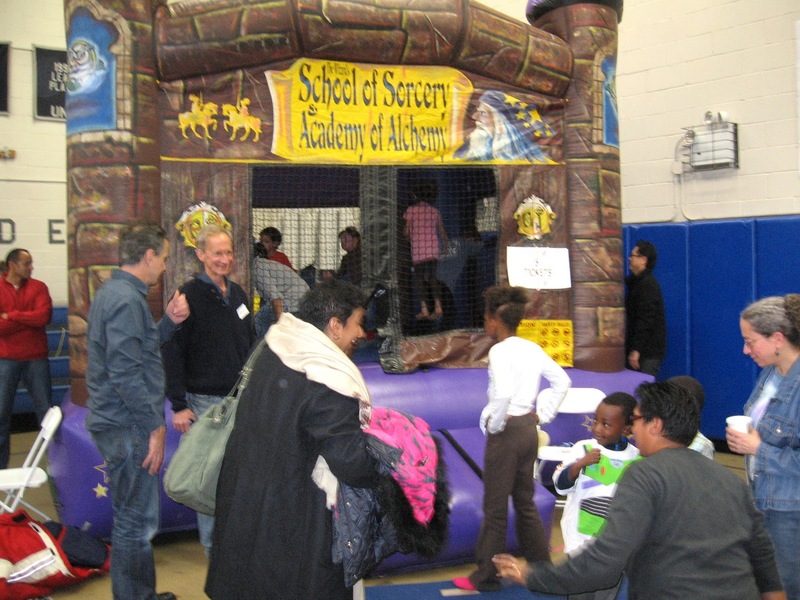 The proceeds from this extravaganza benefits the Horizons Program for public school children in Downtown Brooklyn. Nice work! 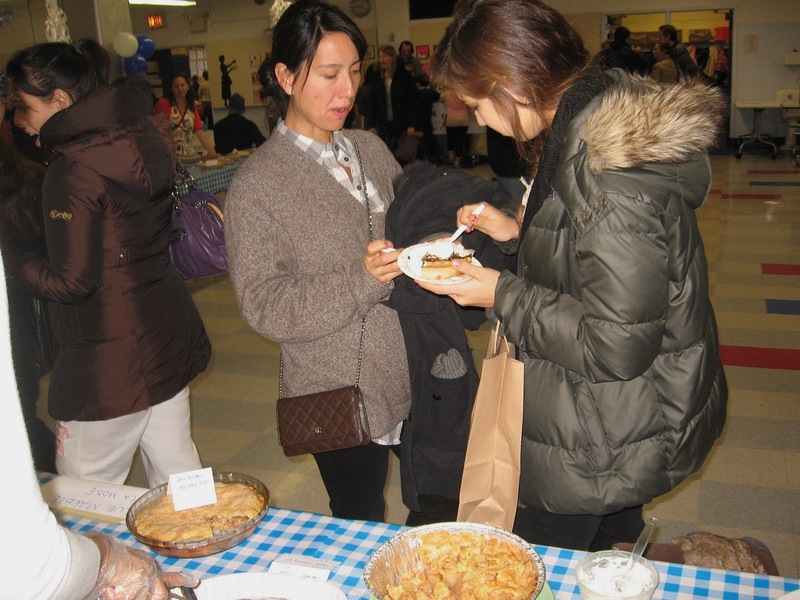 To read about the Pie Festival at P.S. 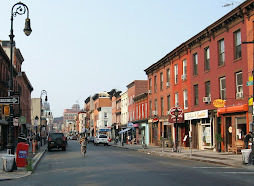 29 in Cobble Hill, see here. According to Flatbush Gardens, the 59-building Brooklyn complex in East Flatbush "is home to an eclectic, friendly community of families, young professionals, and seniors alike. It's a place where neighbors know each other and the management and maintenance staffs are always ready to help. Flatbush Gardens is what home feels like. " So how is it possible that, according to the Department of Housing Preservation and Development, the massive complex has 8,100 current, open violations and counting? An HPD spokesman told the Real Deal, "this is bad -- and we're probably not getting the full extent of it." A look at one of the building's records on HPD's web site confirms hundreds of violations ranging from roaches to defective carbon monoxide devices to mold to defective wood floors and broken door knobs. Seems like that friendly maintenance staff is locked in a contract dispute with landlord Renaissance Equity Holdings. They've put together a video (see the Real Deal) that raises a number of questions about what exactly is going on in the basement out there . 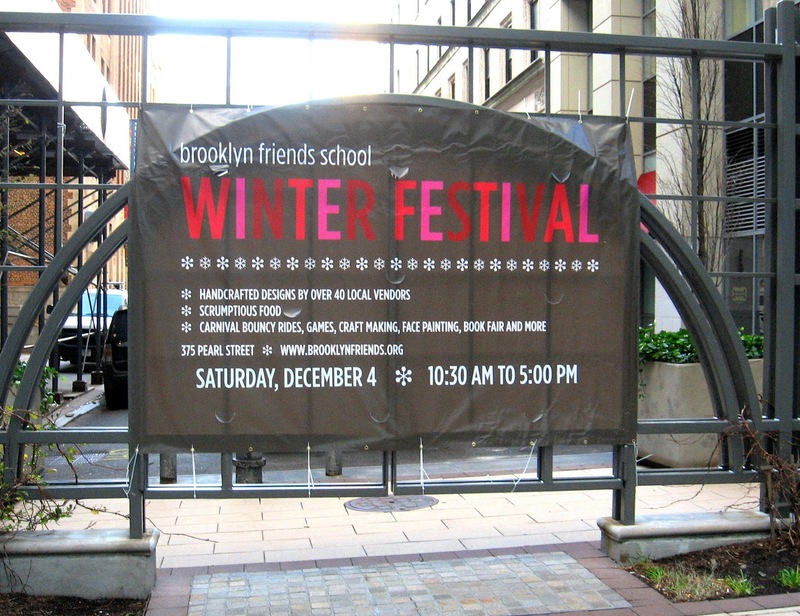 . .
Fun, food and get your holiday shopping done: Don't miss Brooklyn Friends School’s Winter Festival tomorrow, Saturday, Dec. 4, 10:30 a.m. to 5 p.m. Brooklyn Friends is located at 375 Pearl St., (one block from Borough Hall and the Marriott Hotel). 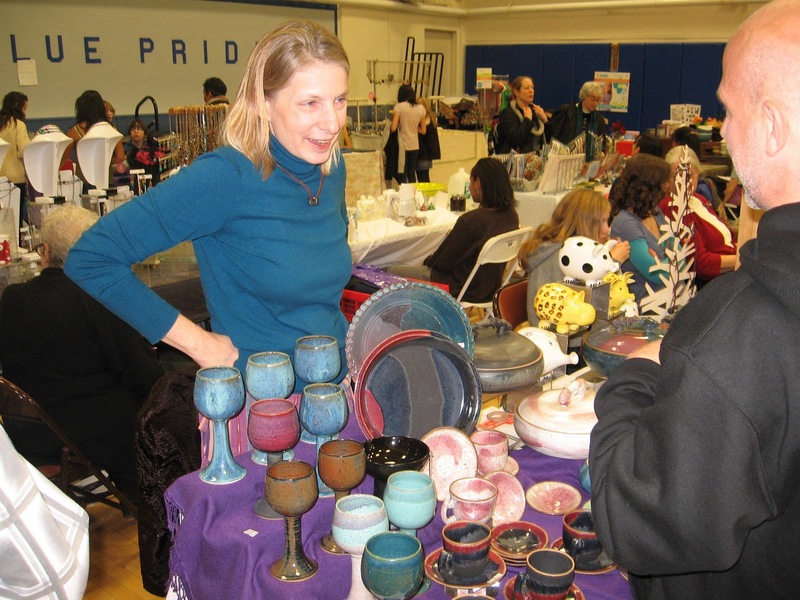 This is one of the great shop-local holiday fairs and has been going on for 31 years now. 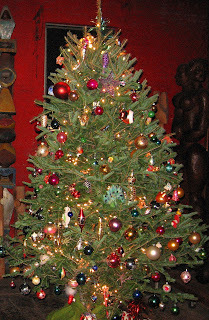 Festivities include an “all by hand” craft fair with 45 local artisans; holiday plant and wreath sale; book fair; children’s carnival with bouncy rides, mazes and games; a children’s craft activity center; and readings by local children’s book authors, headlined by Tad Hills of "Duck and Goose" fame. Info: (718) 852-1029 or www.brooklynfriends.org/winterfestival. Proceeds benefit the Horizons at Brooklyn Friends School summer enrichment program for public school children in Downtown Brooklyn. Walmart officials "have made it clear they intend to open stores in the five boroughs," says Crain's, and the City Council is doing the right thing by holding a public meeting about the store's potential impact on small businesses and the surrounding communities on Tuesday, Dec. 14 (details in the Brooklyn Eagle). One potential location, the Gateway II complex in East New York, Brooklyn, has already received land-use approval. But Steven Restivo, Walmart’s director of community affairs, told Crain’s the company didn't see the need for a council hearing. “This hearing is particularly curious since it seems to ignore the fact that the city is already home to hundreds of stores similar to Walmart," he told Crain's. The Neighborhood Retail Alliance (composed of mom and pop store owners) wants the City Council to reconsider the" myth" that the retail giant -- whether in the form of superstores or "Little Wallies" -- will be an overall plus for New York. 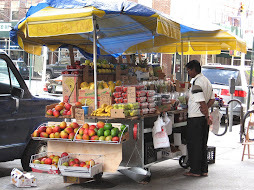 They say that Walmart would have a negative effect on the city's supermarkets and the "immigrant business class" that is heavily represented in the food business here. As part of a study, they've asked store owners to make lists of their local suppliers -- meat and produce in particular -- and will contrast this "local nexus" (the Hunt's Point Market, for example) with the way Walmart brings much of its inventory in from outside the city. They also point out tactics that have worked for Walmart in other cities. In Chicago, for example, Walmart created "a fake community group that purports to represent a community's residents and interests," according to Neighborhood Retail Alliance. That's a tactic familiar to many Brooklynites, and it always seems to work. According to NY1, Mayor Bloomberg -- who isn't bothered by the store's low wages and anti-union stance -- is in favor of Walmart coming in. A truck owned by North Star Food Service backed into a mature pear tree on Montague Street in Brooklyn Heights about 9 a.m. this morning, ripping it out of the ground by its roots and knocking it down. Fire fighters from Ladder Company 118 arrived about ten minutes after the tree fell and sawed it into pieces. UPDATE: More at the Brooklyn Eagle. According to the Cobble Hill Association, a recent proposal offered by community members to negotiate a deal with the Jehovah Witnesses to develop their soon-to-be-abandoned buildings close to the park, for the benefit of park financing is gaining traction. Other park funding models, including Senator Squadron's park increment recapture proposal (named the PIRC plan) also offer relief from the condos plan. Now that Whole Foods Market is moving ahead with their first Brooklyn store at 3rd Avenue and 3rd Street, they've decided to go even greener and have made some dramatic changes to the original design. - The number of onsite parking spaces has been reduced from 430 to 248. - Parking for energy-efficient vehicles as well as specially designated recharging stations for electric powered vehicles will be provided. - Bike parking in front of the store and along the 40-foot pedestrian promenade will be installed. - The store will create a 20,000-square-foot rooftop greenhouse that will grow fresh, organic produce onsite. 20,000 square feet is almost half an acre -- pretty darn decent for a Brooklyn garden. If it is operated like the Whole Foods garden in Richmond, Virginia,the plot will supply fresh produce for prepared dishes and salad-bar options. The enterprising man in the Google Street View image above is ready to roll. He's placed a shopping cart in the middle of the street and has another one ready to go on the sidewalk. Good fellow! The striking building on the corner is the landmarked Coignet Stone Company Building, which isn't going anywhere. 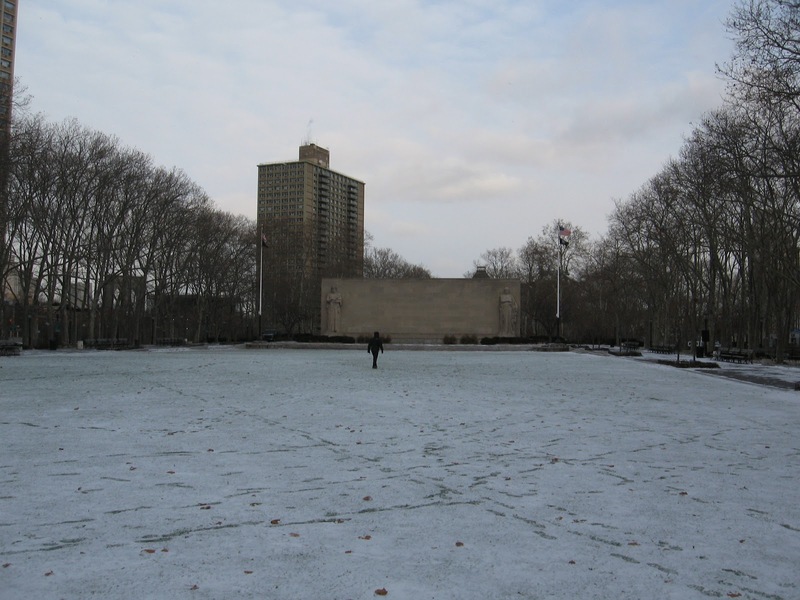 It is one of the earliest known concrete buildings in New York City, and possibly the country. More about it here. Not much surprise here -- in spite of a "No" vote by his eight-member advisory board, state Education Commissioner David M. Steiner caved, giving Mayor Michael Bloomberg what he has been demanding: a waiver that would allow the tragically inexperienced Cathie Black to become chancellor of the nation's largest school system. The legal out Steiner employed (which may not actually be legal) was Bloomberg's agreement to have an actual qualified educator serving with under Black, apparently whispering in her ear about all things educational. This qualified educator is Deputy Chancellor Shael Polakow-Suransky, who has experience running schools and has actual degrees and stuff. Isn't that always the way? The guy with the real talent and experience ends up working as "assistant" to the boss's favorite. Bloomberg says that Black, chairperson at Hearst Magazines (by the way, she seems like a nice person who somehow just got mixed up with the wrong people) doesn't need any experience in education because she's a talented manager. Today a group of talented retired teachers are hoofing it over to Hearst Magazines in the hopes of snagging Black's job. Sounds fair. Hey -- money saving idea! Why not cut out Black and just appoint Polakow-Suransky? We hear he's really qualified. On Wednesday, November 24, several BrooklynSpeaks sponsor organizations filed a motion with New York State Supreme Court seeking to halt construction activities at Forest City Ratner Company's Atlantic Yards site. The motion comes after a November 9 decision from Justice Marcy Friedman finding that the Empire State Development Corporation (ESDC) lacked a rational basis for assuming that Atlantic Yards project would be completed in ten years when the agency approved the project’s 2009 Modified General Project Plan (MGPP). “The difference between 10 and 25 years is a long time to wait for affordable housing,” added Deb Howard, Executive Director of the Pratt Area Community Council.